Step onto the front porch with an outdoor, drop-leaf table before entering the home’s lively, 500 square foot living space. Vibrant walls, high ceilings, heated floors, granite counters and wood accents welcome you into the home. The modern, completely open kitchen boasts a gas-burning stove top, granite counters and a center island with bar seating for 4. Share cups of freshly brewed coffee in the morning and collaborate to prepare fresh, gourmet dinners in the afternoon. Move freely from the kitchen into the living room and sitting space, where comfortable seating surrounds a flat-screen Smart TV with local channels and streaming capability. Unwind with your favorite movies after an exciting day of sightseeing. In the bonus upstairs living space, guests will love relaxing in the natural light streaming through the sky light while reading a book. The master bedroom is nestled behind the kitchen and living room on the main floor. Enjoy peaceful nights on the Tempurpedic queen-sized mattress, before washing up in the pristine bathroom and preparing for your daily adventures. Portland is known as one of the country’s best food towns, with over 600 registered food carts and more breweries than any city in the world. There is also a vibrant music, film and visual art scene, with many famous theaters and museums. This property offers a prime location to explore the area’s many attractions. A bike path and bus stop are both within walking distance, and downtown Portland is just fifteen minutes away. Grab some street food, see a show at a historic theater, walk around the parks, and take in the city’s beauty and nightlife. The Woodstock neighborhood has a lovely park just a block from your cottage. There is shopping and dining typical of Portland on Woodstock Boulevard, while the beautiful Reed College Campus is 1.5 miles away. Enjoy a ten-minute walk to Reed Canyon, with a lovely green space and creek that runs straight through the college campus. - Great Portland location - Easy access to bike trails and public transportation leading to the city’s vibrant cultural sites! I am a registered nurse consultant at one of our large integrated health systems in Portland. I travel from Salem to Northeast Portland during the day. I am a partner in a small start up company, Tracefind, offering innovative and safe technical solutions to problems in surgical healthcare settings. I received my BSN and MS in Nursing from Augsburg College and the University of Minnesota in Minneapolis MN and my PhD in Human Science at Saybrook University in San Francisco CA. I've been living in Portland since 1998. I purchased the property I live in and rent in 2000. In 2015, I decided to take advantage of the City of Portland's offer to reduce permit fees so that owners could build additional living structures on their property. The purpose was to "densify urban living space. Construction was completed in spring of 2016. I tore down my old 1930's garage to build a cottage adjacent to my corner lot home. I love living in Southeast Portland. I'm close to everything and my neighborhood is full of people of all ages, including young families, working adults and retirees. I am within walking distance to Woodstock village, Reed College Canyon and a lovely new yoga studio I frequent. Cottage was exactly as advertised. We enjoyed our stay and the owner was very responsive. Patricia is great to work with. The cottage is newer and has nice furnishings and appliances. It is very small, and the 2nd bedroom is a loft that isn’t approved for renting because the stairs are steep and uneven. The loft isn’t for small children. We enjoyed our stay, and loved the neighborhood. We were just surprised on how small the cottage actually was when we arrived. We didn't plan to spend much time in the home, and we didn't. The place was clean and cozy for us. The kids liked it, and we slept well. I was alone with my 2 kids on vacation, which is the first time we've ever done that, and I was able to supervise my children around the stairs. They're precarious but manageable with adequate supervision. And FUN for the kids too to feel up high. Location was perfect for us with a park right next door. This little cottage was the perfect place to help my mom and her boyfriend rent for their visit to Portland. They are older (80 and 86) visiting from the midwest. They were unfamiliar with this type of rental. They found the rental a charming home while visiting me, equipped with everything they needed. They raved about how much they enjoyed their stay. They did have to navigate carefully around the spiral stairs, they slept on the main floor, but felt it was little inconvenience for such a charming place. I live in the nearby Reed neighborhood and found it easy and convenient to visit or pick them up for sightseeing. They liked the location and wandered down to Woodstock on their own for any food/snack supplies needed. Overall a wonderful experience! 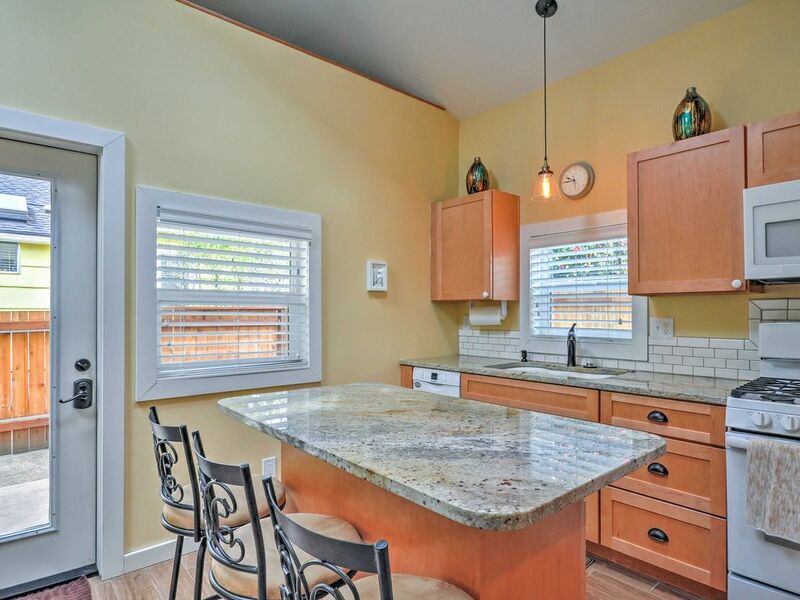 Beautiful cottage conveniently located a few blocks from the main Woodstock commercial strip, with easy access to restaurants and neighborhood shopping. The cottage is clean, comfortable, and modern. Patricia, the owner, is very friendly and welcoming. Thanks again for the great stay! Great little cottage in Woodstock! Patricia was very accommodating! Cute very clean little cottage for us. Quiet neighborhood with eaay access to resturants and groceries. We rented a car from the enterprise close by to see the mountains and coast.